What is the name of the Chemical thaqt supposedly takes the place of Flame treating? I know there is one, I just can't think of the name of it. @Gunsmith53 Big Brain has Blast Majic and PPG makes one but can't think of the name. Yeah check out Big Brain's. Supposedly works very well. There it is! Thanks Jason. Is it hard to find? I bet the shop has it don't they? @Gunsmith53 - you're not talking about an adhesion promoter are you? Because the way it was explained to me, this sx103 doesn't act as an AP. Can anyone confirm this? @IceMaster its not a AP you are correct. It removes the molding release agents. If you want a AP buy some nano-chem. Use a paint like aqualac, or lowcountry you wont need a AP, I know Joe still uses a AP even though he uses Aqualac just incase. @TrayersSlayers - I'm the same as Joe, I've got into the habit of using an AP just as a safety precaution. I use Hydro Solutions and an AP is still needed for polypropylene but I just use it on all plastics to be sure. You need AP with Aqualac sometimes. We use NanoChem AP then Aqualac on polypropylene parts all day long. Anything blasted? We just shoot Aqualac direct. We have had fantastic Adhesion w Aqualac direct to ABS and nylon. And some others, but those two I remember for sure. @IceMaster Im going to chop up a hdpe blue barrel sat use 103 and blast then 103 then aqualac. Ill post results to see if you need a AP still with HDPE. With aqualac of course. 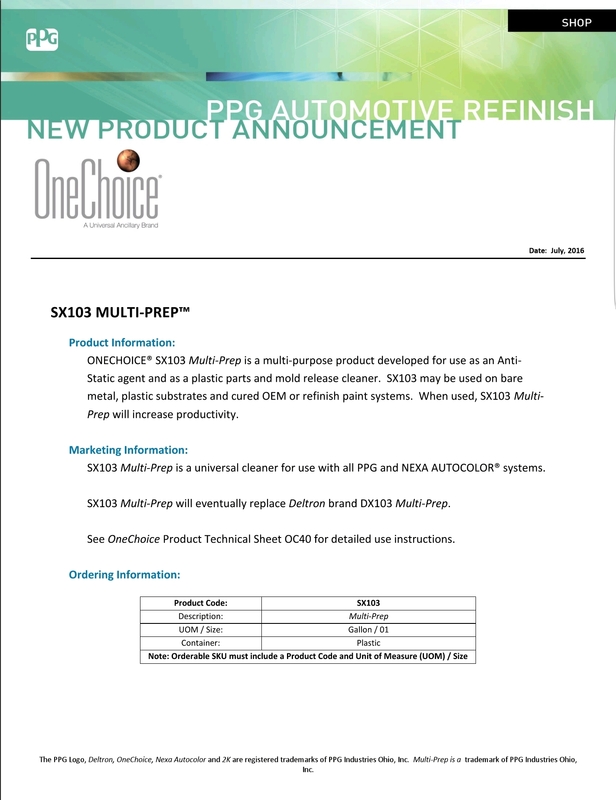 PPG Sx103 is a plastics cleaner. I have used and tested just about every no flame treatment out there they all peeled off eventually. I am testing the following method for the last few months and it is holding as good as flaming. Degrease with wax and grease. Blast I use glass media. Scrub with red pad and 3m scuff it. Wipe with PPG SX103. Follow instructions close I do it twice. Spray pliogrip TPO adhesion promoter. I can only find this AP in a spray can. Be careful not to make any runs with this AP it is vey hard to sand smooth. I let it sit for 15 min then hit it with epoxy and base coat. So far no issues but only time will tell. I am trying to weigh the cost and time involved looks like I am leaning towards a shrink fast gun to speed things up and go back to flaming. I have talked to a few plastic paint companies and flaming is a proven method. Thank you for this! I want to test a few things as well. For a production run of HDPE parts? I still think a shrink fast gun and isopropyl followed by quality AP will be most cost effective. I have no actual testing yet tho. Of course flames being used in a separate area of the shop, but cost/part is huge on production. Hdpe will eventually sweat out release agents unless it has been flame treated, regardless of what you put on it. It may grip for a week or two, but as soon as it is exposed to heat/sunlight for a period of time, it will sweat, and pop off tape, paint, bondo, etc. flame treat hdpe ALWAYS. Car parts are not HDPE. Most car guys no nothing about our process. Ok said the heck with the barrel. Went to the good old homedepot. 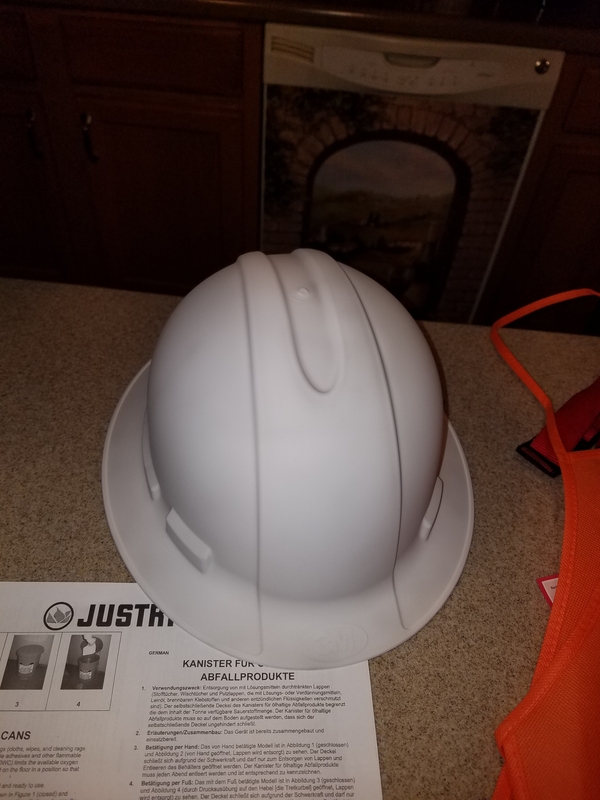 Got a hdpe hard hat. I wiped it, blasted it, will be wiping one more time tomorrow as i ran out of time tonight. And paint with Aqualac then dip. 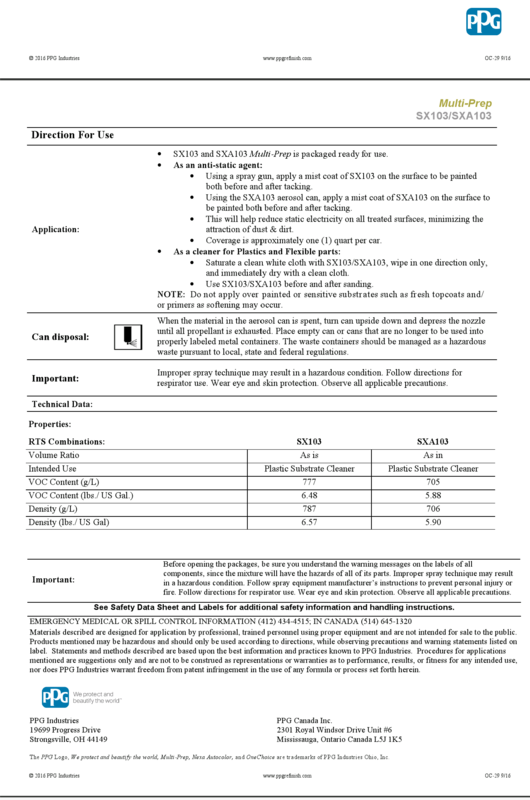 It says in the description of sx103 its for mold release agents? True...on the surface. But the thing is that the mold release agent isn't only on the surface of the part. It's mixed in with the molten plastic before it's molded. Heat brings it to the surface, thus the flame treating to remove it. These chemical agents may remove it from the surface, but how can they wick it out of the plastic itself? It may pass an adhesion test today, but what about after the hard hat or other part is subjected to heat down the line and more release agent makes it's way to the surface under your paint? It's why flame treating takes several passes, cleaning with alcohol between each pass. It keeps coming to the surface. You flame treat until it stops coming back up. This is exactly what I've always wondered. HDPE is the only plastic I flame treat. The other chemical prep products work fantastic on Polypropylene. The argument is that "auto body shops never flame treat!" But if they're not using HDPE or LDPE parts, that's not going to matter. Just as an FYI, Soda bottles are made of PET and not HDPE. Well here she is. Wipe with ppg sx103, blast 80grit 80psi, wipe down one more time, nanochem AP, Aqualac, then dip. Slightly under activated had some fade and around the rim. 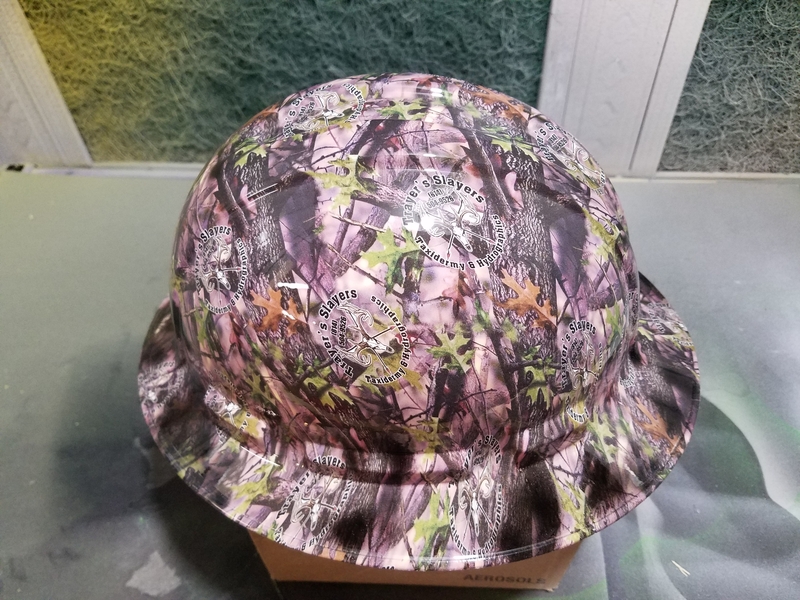 But 1st hard hat and still getting the hang of liquid concepts custom films. Gloss clear layed out flat no fish eying from any sort of leach through. The process works. But don't take my word for it try it for yourself and post your results. Some guys use Transtar epoxy prime instead of AP that seems to work well also. All I asked was to give the process a shot before tearing it down. @K2Concepts Jim you imput is always Appreciated. Yeah see... here's the thing. With what you did, yes it will stick. Just degreasing with alcohol, blasting and NanoChem AP would work for that. The question is how well and for how long. On a custom project part, it's not like you can do cross hatch tests on it without destroying all the work you have into it. I've still yet to see someone do a thorough test on anything. Not even flame testing then leaving it in the sun. I'm going to have to set up a test. Guess I'm going to be picking up some hardhats next time I'm at Lowe's. LOL! I'll start a separate discussion and I would love some input on how to set it up and which products to test. I figure beginning of summer is a perfect time so I can leave stuff out in the sun. Stay tuned.